Statistical agencies provide masses of data and every launch of an agency’s new website is an exciting experience: how do they manage to present their data for different user groups? On August 1st Statistics Italia did it! Here some words from the official announcement: ‘Information is organized by theme and territory, which increases content traceability along with tagging and search engine optimisation. A beautiful design, clear, fresh, good pictures, attractively animated header! Innovative functionalities: graphic widgets and a simple but effective database widget (find local information) on the first page and on thematic pages. But: after downloading a graphic widget no information about country or source of information visible in the chart ( lost context) . Good outreach with news feeds in diverse formats (RSS, Atom, JSON). Navigation distributed over the page from top to bottom, sometimes in the middle of a content page: Not so easy to be understood intuitively. The (more and more important) mobile access hidden in the footer. An open philosophy: Not only open data licence but also open for using third party tools like fusioncharts and NComVA visualisations. It’s like an app, a separate presentation not embedded into the navigation of the mother website. One single link only – behind the NSI logo – gives the context to the whole statistical content offered by Statistics Italia. I speak of … noi italia. And it’s beautiful. A mix of static and dynamic (flash, delivered by NCVA) content, text (some call it storytelling) with interactive graphs and maps. .
With the same technology used by noi italia Statistics Sweden just launched its Statistikatlas and also some thematical visualisations or vislets integrated into the website. Compare i.e. with EUROSTATS Table Graph Maps application which has no texts or storytelling included. 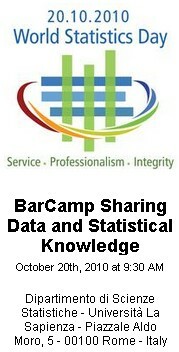 In Italy there will be taken a interesting initiative in organising a BarCamp for the World Statistics Day. This form allows members to participate in a number of different workshops. IMAODBC 2010: And the winner is . . . The Bo Sundgren Award of the International Marketing and Output Database Conference IMAODBC 2010 in Vilnius goes to Vincenzo Patruno from Statistics Italy ISTAT. In his presentation about Data Sharing Vincenzo Patruno demonstrates the use of widgets for the dissemination of statistical informations. Widgets are small pieces of code which can be embedded in a website and interact with an application, i.e. a database. Once embedded the information they provide is always updated automatically whenever the application itself is updated. 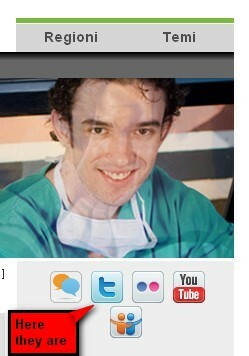 See some examples on Vincenzos Blogespecially the post How to Share a whole application on the Web. The small table with figures for Rome on the right hand-column of his blog is such a widget. Translate a website with connecting links in seconds! Here is an example of translation of a unique ISTAT education material from Italian into English. Google Translate manages most combinations of languages. Not perfect but understandable, isn’t it? And also all connecting links in Italian are translated. Try and compare with the official English version, which is often not comprehensive.